Every bicycle collector in the Netherlands is familiar to cross frames. Some 50 years ago, every self-respecting Dutch bicycle factory had at least one in its assortment. When you tell an Englishman that you have five cross frames in your collection, he will look at you in wonder, whereas a German would ask you in reply what you are talking about. How come, and how did the phenomenon of these cross frames evolve through the decades? 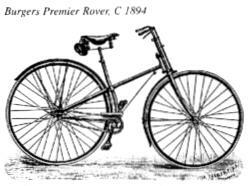 The first bicycle to be called a cross frame was the "Premier" in 1886, made by the (British) Hillman, Herbert & Cooper in 1886. The cross frames were one of the first safeties and were made by several companies until the nineties. The cross consisted of the seat tube and a tube that connected the head tube to the rear axle (the last part of course as a fork, encasing the rear wheel). A down tube failed. The names were numerous, too. 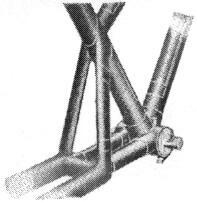 A cross frame having two tubes crossing in the middle was called an X-frame. 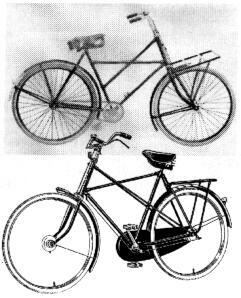 Other names for bicycles with an extra reinforcing tube were girder frame or truss frame, derived from load-bearing constructions. The Quadrant bicycle (built under licence by Alt in Leiden, the Netherlands) is an example of such a girder-frame, the girder being the diagonal extra tube in the diamond-frame. In the Alt-catalogue, the two short tubes behind the bracket are mentioned as duplex-tubes, although strictly -according to an expert from England- these are 'struts', making this a 'strutted girder frame'. A duplex girder frame or duplex cross frame was a frame that was made -in part- in duplex-tubes: small double tubes that could replace single tubes of a regular diameter. Some of the names of special frame designs in old brochures are derived from these terms, as Girplex, Crossex or Trussex. By 1901, this new fashion came to the Netherlands. Some of these cross frames were imported to the Netherlands, some manufacturers (amongst which Eysink, Fongers, B. A. Jansen and Simplex) made their own models. The rest of the article comments on "a scientifically proven mistake in the current model frame: the mistake of lateral suspension". As a result, a regular bicycle would be more likely to slip sideways on a slippery surface and some pedalling energy would be lost. Frankly, we do not see the necessity of manufacturing a stronger frame than the diamond frame which we make since years and which is copied by the large majority of bicycle manufacturers. 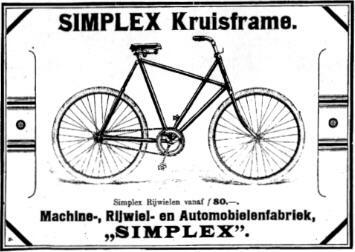 However, many riders will get the impression that the cross frame is the newest and the fashion bicycle of 1901, because of the publicity that is made. Despite the fact that we declare that we are convinced that there is no urge for this novelty, we see no objection to honour our customers' requests. ... We have considered this decision very well and it has cost us a great deal to be able to bring our cross frame to the trade. What this move lacked from a marketing point of view was made up for by the design of the bicycle. By the way, the double-tubed front forks could be found at Humber bicycles until the early sixties. In the Netherlands it seems to be that it took less than ten years for the cross frames to disappear from the brochures. In Germany, it was even less successful: they are practically unknown. In the available literature, we found only one model from the brand Brennabor. In the UK, however, homeland to the bicycle industry, cross frames were manufactured up to the thirties. 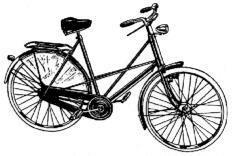 Raleigh, that had them in their collection as early as 1897, kept on advertising them 'at home' up to 1935, and in the Netherlands even until 1936. At this point, we have arrived at the third phase in the history of the cross frame bicycles. In the Netherlands -and obviously in no other country- the cross frames became really popular by the late thirties, together with the reintroduction of a different category bicycles: the tandem, and a flourishing development of the (bicycle-)industry. After the depression of the first half of the thirties, people bought more bicycles, obviously providing opportunities for more special models. One of the first, if not the first, was Gazelle in 1930. Other well-known brands like Simplex, Juncker, Locomotief and Germaan followed suit in the late thirties. In the early fifties, every major brand had one or more models in its collection, with the striking exception of Fongers. The probably most popular model was the Locomotief "Super de Luxe", which was promoted as a unisex cross frame. In the late fifties, the pendulum swung for these bicycles, and by the sixties -as far as we know- again only Gazelle kept on producing cross frames. After that, silence fell for twenty years. In the eighties, things started to happen in the bicycle business. Bicycles became a fashionable thing, and together with the 'randonneurs', MTBs and ATBs, on a smaller scale, cross frames appeared. Van Raam from Aalten, the Netherlands, was an early adapter and provided a model like the Locomotief under his own brand, and from 1984 for Utopia in Germany. Since app. 1985, Batavus sells a comparable model for ladies and a duplex-reinforced gents' model. These bicycles are also being sold under the Altra-brand. In 2001, Gazelle introduces a very similar model as well. Introduced in the same year, Azor, a young manufacturer from Hoogeveen, sells a cross frame bike like the old Simplex/Juncker, along with ladies' model which is similar to the Locomotief cross frame. Some years ago, Union introduced the so-called 'double-easy' frame, having crossing tubes as well. Furthermore, some non-branded cross frames can be found at certain bicycle resellers. Even some MTBs have a frame that can be qualified as a cross frame; they will not be discussed in this article. Nowadays, Utopia from Saarbruecken, Germany, is the most extensive in its choice of models. This company tries to reintroduce the idea of a basically comfortable while state-of-the-art roadster-type bicycle. Here you can find new versions of the Locomotief unisex cross frame and the Gazelle gents' cross frame design. The frames are still made by Van Raam and some of the parts mounted are of Dutch make, as well. In quantity, production of cross frames isn't -and never was- too impressive. Nonetheless, the idea of an extra-tube reinforced frame seemed to be too appealing to disappear. How come and what was the motivation of the buyer to choose for a bicycle with a cross frame? When you have an accident with a regular gents' bicycle, the fork and the wheels appear to be the weakest parts: they bend. If the accident is more serious, chances are that the frame is upset -by the head-tube being bent vertically- or twisted (head-tube and seat-tube are bent sideways, both in different directions). It is a result of the trapezium-shape between the head-tube and the seat-tube of the regular frame, especially with large frames. An ideal cross frame construction where all tubes are connected with each other at the corners, results in a pure triangular design, being much stronger. For the sake of a more open frame, some manufacturers divert from this ideal type. Furthermore, in a sideways collision the rear frame can be pushed out of the centre. A frame with duplex-tubes at the rear axle provides a lateral triangle as an extra reinforcement against this stress. During riding, much stress is applied to the bracket. It can be relieved by using double tubes (as with the Elswick cross frames), but the aforementioned "strutted"-design can do this as well. - to make a racing bicycle stiffer, thus minimizing loss of pedalling force. The necessity of this improvement in comparison with the added cost and weight is debatable, depending on the use of the bicycle. Anyway, the improved torsional stiffness of a cross frame is striking. Regular ladies' frames tend to 'sag', making a cross frame design an option worth thinking about. A regular diamond-frame is strong enough for everyday use, but in the case of an accident it can become obvious what the better triangular design can stand. These advantages are of all times and do not explain why the popularity of this type of bicycle has changed so much. Obviously, it has been a matter of fashion. Cross frames stand out, and in times that bicycles attract attention, it can be used to an advantage. Manufacturers want to offer more than their competitors, and the consumer likes to have a special bicycle. After a couple of years, different ways are found to impress ones neighbour. All this taken into consideration and looking at the history of the cross frames as outlined above, things can become more clear. On the next page, different types of cross frames are shown, along with the applicable brands and years. The focus lies on designs (also) made by Dutch brands. This overview is certainly not complete. A special bicycle to be named in this context but skipped in the overview, is the Dursley-Pedersen. It was patented in 1893 and taken into production in 1897. This is actually a pure cross frame design. Mads Rasmussen from Denmark has set up a comprehensive homepage about Dursley Pedersen bikes. Translation by Dirk den Hamer. Thank you, Dirk!